Not only does Colorex provide an advanced technical solution, it is also aesthetically pleasing, enhancing any commercial interior from industrial to educational establishments. 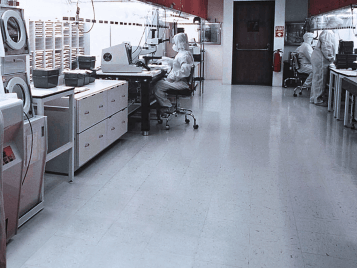 Colorex EC is Ideal for laboratories, IT-rooms and ISO standard cleanrooms . Colorex EC satisfies the strictest requirements for particle release behaviour, helping to reduce any threat of contamination. 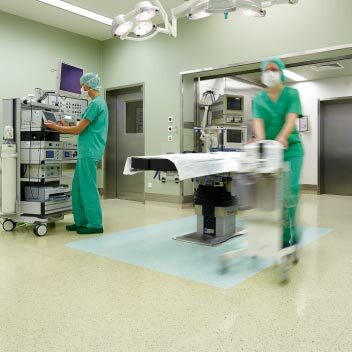 Colorex Basic Plus is a loose lay floor system with a Colorex surface without conductive properties. This ensures all the benefits of Colorex such as high density, easy repair and stain resistance, but also combines the benefits of a heavy duty loose lay tile. The Colorex collection offers a premium brand of conductive and static dissipative high density dimensionally stable tiles. R11 Plus floors have enhanced slip resistance, categorised as R11, because of the strong surface embossed structure. The range is available in one colourway, 601060. 8. 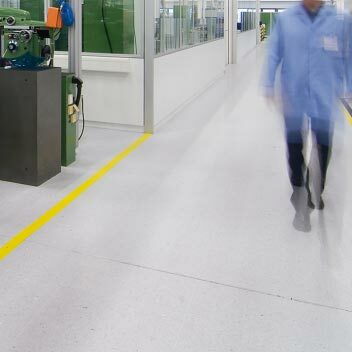 Colorex is available in tile format, a prerequisite for raised access floors found in many commercial environments such as data centres and server rooms. 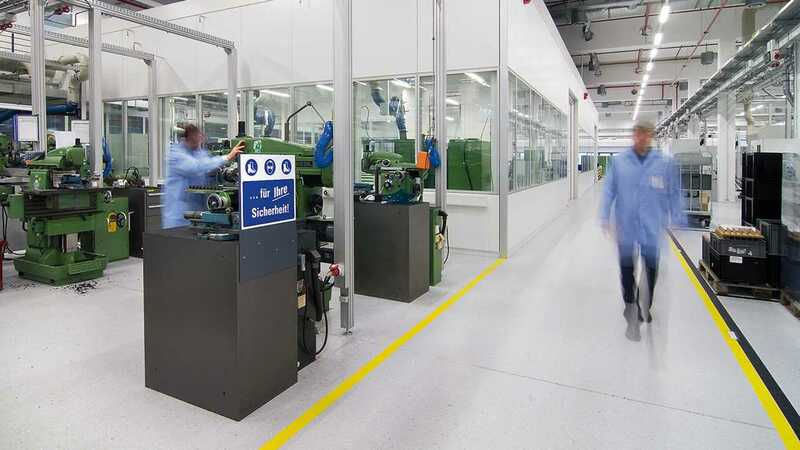 We constantly strive to produce sustainable flooring systems that create better environments everywhere. At the same time we help take care of the natural environment through our commitment to sustainable development, responsible raw material procurement and manufacturing processes. For example our Colorex collection is manufactured using 100% green electricity and is REACH compliant..
• Colorex contains 15% post industrial recycled content. • The low plasticiser content in Colorex ensures low emissions and outgassing. • The surface of Colorex can be fully repaired extending the useful life of the product. Colorex is available with three levels of conductivity - High performance (EC range), Performance (SD range) and Standard. There is also a choice of fitting as Colorex can be installed by fully adhering it directly to a subfloor or by bonding it to a raised access floor panel. It can also be laid as part of a loose lay tile system. 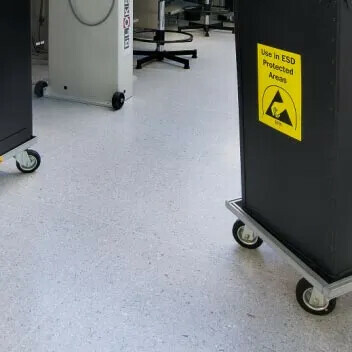 The loose lay version additionally has an anti static (Basic plus) and slip resistant (R11 plus) version to complete the high tech solutions offer. Colorex SD enables safe electrostatic discharge through the whole thickness of the tile via the black conductive veins. Colorex Basic plus is a loose lay floor system with a Colorex surface with limited conductive properties. This range provides all the benefits of Colorex such as a high density, repairable and stain resistance with the benefit of a heavy duty loose lay tile. Colorex is only available in tile format as this enables quicker installation, especially in small and medium areas or rooms with irregular shapes. The tile format also ensures less wastage than sheet, making it the environmentally preferable option. As Colorex also has very low plasticiser content there’s no need to worry about emissions or shrinkage and the corresponding diminishing of conductive properties. Our production process produces a material of superior and consistent quality with an extremely high and uniform compression. The easy-clean surface is pore free, making it suitable for the most stringent hygiene requirements, right up to certified cleanrooms. 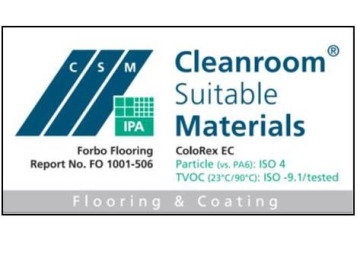 Colorex provides all the features normally associated with ESD sheet product but with the additional benefits associated with tile format such as reduced waste and ease of installation. 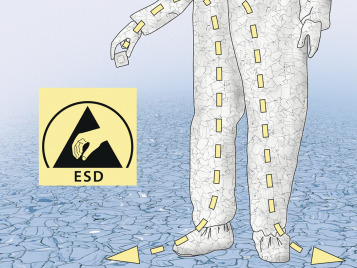 ESD sheet products require a high plasticiser content which can result in out-gassing. In contrast, Colorex tiles have a small percentage of plasticiser content and a result, very low out-gassing. Deep scratches and other serious damage can be repaired by hot welding. A small strip of Colorex of the same colour should be welded directly into the damage using a hand welding machine. After the excess material has been trimmed off, the repaired spot can be restored to a good-as new condition by sanding and dry polishing. In order to provide our customers with peace of mind, we measure and report the conductivity of each production batch. As a result of this quality control procedure, we establish a measurement report showing the distribution of conductivity values within a single batch. These reports are available to the customer upon request. ISO standards and cGMP regulations for air purity require you to comply by presenting consistent results that can be verified on a regular basis.. 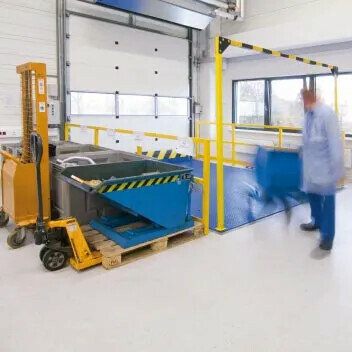 Ideal for cleanrooms and these kinds of environments, Colorex satisfies the strictest requirements for particle release behaviour, helping to reduce any threat of contamination. 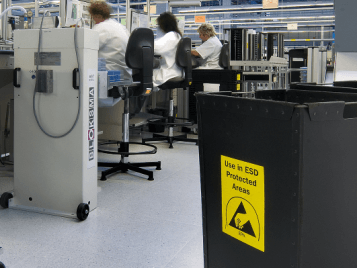 What’s more, following a comprehensive programme of testing, its suitability in cleanroom applications has been certified by the renowned Fraunhofer IPA Institute in Germany..
ESD facilities, ISO standard cleanrooms, pharmaceutical laboratories, production sites and operating theatres. Renovation of ESD facilities, ISO standard cleanrooms, pharmaceutical laboratories and production sites. Suitable when down time, damp floors or poor sub-floors are an issue. 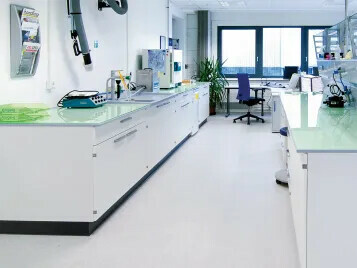 New built laboratories, ISO standard cleanrooms, pharmaceutical laboratories, production sites and operating theatres. Shops, stores, warehouses. Areas with high traffic needing daily intensive cleaning. Suitable when down time, damp floors, or poor sub floors are an issue. Industrial areas, garages, warehouses. Suitable when down time, damp floors or poor sub floors are an issue.